1. Post the logo on blog. I would like to pass on this award to the following bloggers, each of whom has offered encouragement as well as great reading. How very sweet of you! Thank you so much for the honour! I will post this right away, have a great weekend! What an honor to receive the award! Thank you so very much. It is most encouraging. Hopsy will have to help me figure out how to do the linking, etc. Love your blog! Awww what a great award! Thank you so much! Congratulations to you and everyone you awarded! Thank you so much. I am digging myself out of the hole opened up by my week taking care of my stepdad, but I look forward to answering this as soon as I can. I'm humbled and honored. 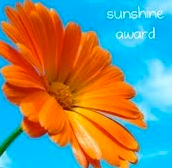 Your award certainly brightened my day and I had fun passing it on. Blessings!